Eric Schneiderman is the 65th Attorney General of New York State and previous State Senator from New York. He has one daughter, Catherine. After graduating from college Schneiderman served for two years as a Deputy Sheriff in Berkshire County, Massachusetts, where he started the first comprehensive drug and alcohol treatment program at the Berkshire House of Corrections. He previously spent 15 years in private practice as an attorney, and later as a partner at the firm of Kirkpatrick and Lockhart, where he handled complex litigation. He was also a public interest lawyer for many years, representing taxpayers in historic lawsuits against the Metropolitan Transit Authority (MTA), tenants trying to evict drug dealers from their buildings, and women seeking access to health clinics. He was elected to the New York State Senate in 1998. From 2003-2006, Schneiderman served as the Senate Deputy Democratic Leader. In 2007, He was appointed to the New York State Commission on Sentencing Reform. In 2008, Senator Schneiderman became a national co-founder of Legislators Against Illegal Guns. Since January of 2009, Schneiderman served as the Chair of the Senate Codes Committee, which considers criminal and civil justice legislation in New York State. In addition to his committee assignments, he also served as the Senate Deputy Majority Leader for Policy. Standing Committee Assignments 2009: Codes (Chair); Children & Families; Environmental Conservation; Energy & Telecom; Higher Education; Judiciary; Cultural Affairs, Tourism, Parks & Recreation. On October 22, 2000 the Peoples Weekly World held its 4th annual celebration luncheon in New York, at the Henry Winston Auditorium. Speakers included City Councilmembers Bill Perkins and Christine Quinn, Assemblymember Richard Gottfried, State Senator Tom Duane, Larry Moskowitz of the Communist Party USA and Working Families Party and Elena Mora for the Communist Party. US Rep. Charles Rangel sent greetings and State Senator Eric Schneiderman sent a letter of commendation to the honorees. Scheiderman told the convention - There's been an incredible explosion of wealth...the two parties have presided over this shift, in which the rich have kept all the money". Scheiderman added that due to tax cuts for the wealthy "there won't be any money for people's needs'. Communist Party USA members Elena Mora and Gabe Falsetta wrote a report for the People's World, of November 19 2004 "Many positives in N.Y. elections," commenting on the gains made by "progressive" candidates. Tom Duane, David Paterson, Eric Schneiderman, and Liz Kruger, all of Manhattan, all retained their Senate seats. Brian McLaughlin, president of the New York City Central Labor Council, won a seat in the Assembly. The Rev. Al Sharpton, Senator Eric Schneiderman and Assemblyman Hakeem Jeffries joined forces with a statewide coalition Jan, 28, 2010, to announce a new organizing campaign plan to end prison-based gerrymandering in New York State before the 2010 Census. The coalition’s goal was to organize across the state to pass Senator Schneiderman’s bill that would require New York State to count incarcerated persons in their home communities--rather than in the districts where they are incarcerated--for purposes of drawing legislative district lines. If passed, it would be the first law in the nation to count prisoners in their home communities for districting purposes. “It’s an absolute injustice that New York currently counts people in the districts where they are incarcerated, rather than in their home communities. I am proud to be here to join forces with Sen. Schneiderman, Assm. Jeffries and this coalition to end this unconstitutional practice. If we do not act soon, it will be 10 long years for another opportunity to right this wrong. We cannot afford to wait,” said Rev. Al Sharpton. Assemblyman Jeffries was the bill's lead sponsor in the Assembly. 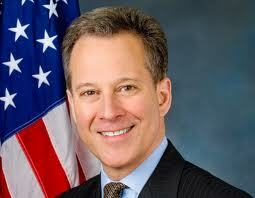 Schneiderman was elected the 65th Attorney General of New York State on November 2, 2010. In 2010, as the foreclosure epidemic raged, George Goehl, executive director of National People’s Action, and Stephen Lerner, Service Employees International Union organizer, brought unions, community organizations and faith groups together to pressure banks and the Obama administration to do more for families losing their homes. As the New Bottom Line coalition, they mounted protests at bank headquarters around the country, generating media attention and helping Attorneys General Eric Schneiderman of New York and Kamala Harris of California successfully push for a stronger national settlement with several major banks, which resulted in more than $26 million in foreclosure relief. "Here are some of the leading artists, athletes and influencers helping to spread the word about the People's Climate March, including Eric Schneiderman." This page was last modified on 2 May 2018, at 10:09.